So lately I've been OBSESSED with Sun labs self tanner now that fall is here, and I don't get quite as much sun. Its been really my go to product this last month. I don't put to much on my face as often as I put it on my body. The kit comes with 3 products. a exfoliate scrub, a self tanner, and a maintainer. Best of all they're ALL paraben free. When it comes to a lotion (that I put on my whole body) I try to look for a paraben free product considering you are apply it to more then just your face. I do find it very hard to find products that don't have that nasty preservative in it so once I did I was very excited. I've tried so many different self tanners, and can finally say that I am pretty pleased with the results and will be repurchasing. This sunless tanning system is a must try for anyone who likes to have a great tan all year round. This system is very easy to use. First exfoliate your whole body with Exfoliating Body Gel to clean and revitalize skin. Then apply Tan Maintainer Moisturizer on any dry area. This will keep your tan looking flawless. Then apply everyday to help maintain your tan. Apply Sun Labs Dark Sunless Tanning Lotion all over body. This product is so gentle you can even use it on your face. It comes out a nice chocolate brown so you can see where it is being applied. This great tan will last 5 to 7 days. Apply every few days to get even a darker richer tan. 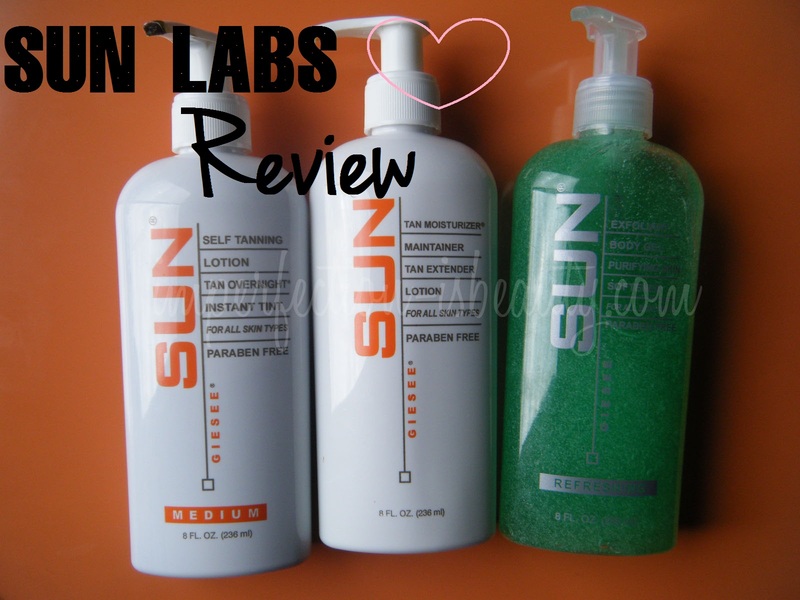 Sun Labs Beach Bag is a great gift with purchase. Overall its a great product, I really love how easy it is to apply, and how fast it dries. It is a lotion and the constancy is pretty ideal for a self tanner. The color is so dark therefore, it is very easy to see where you are applying it. I do suggest using a rubber glove when applying to your whole body because it does stain pretty quickly, or using a scrubber brush to brush the color off your hand immediately. The color is instant so you'll notice a significant difference in your skin just after the first use, and it will increase. I do apply this every other day. You are suppose to apply the maintainer the same day you apply the self tanner. (apply maintainer at night if you apply the tanner in the am and vise versa) It does have a little bit of a self tanner smell but nothing that awful. The tan does last a good week (unless you take a very hot shower) and in that case it doesn't last as long. The whole kit runs about $40 which is a great price considering everything included. I've used this for about a month and only put a dent in it so I would say this will be lasting me a pretty decent amount of time. For my face I do mix it with my moisturizer so that it doesn't clog my pores, and break me out. YOU NEED TO PUT THE COUPON CODE INTO THE COMMENT SECTION OF THE ORDER. THE 5% WILL BE DEDUCTED FROM THEIR CREDIT CARD ON THE FINAL ORDER AMOUNT BEFORE IT IS PROCESSED ON THEIR CREDIT CARD. What self tanner have you been loving lately? Disclaimer: The products mentioned in this post were sent to me for consideration, however all opinions are honest and my own from personal experience. @Dani YES they do have dark and ultra dark. I got medium and it worked for me but I haven't been tanning to much at all lately so it worked perfect, but next time I'd go a little darker. I need a good tanning cream; Im going on vacation in a couple weeks and I'm white as a ghost. I really like L'Oreal's sublime tanning gel. It gives a nice dark color but unfortunantly when it comes off it looks really patchy. I might have to look into this next time im in Sephora.